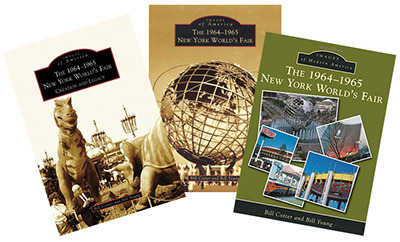 I've been fortunate to have had three books I co-wrote about the Fair published so far. All were done in partrnership with Bill Young, who runs the great nywf64.com website. 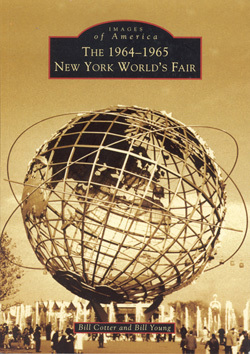 The first book was released in 2004 to mark the 40th Anniversary of the Fair, and it provides an overall look at the Fair and many of the pavilions and exhibits. 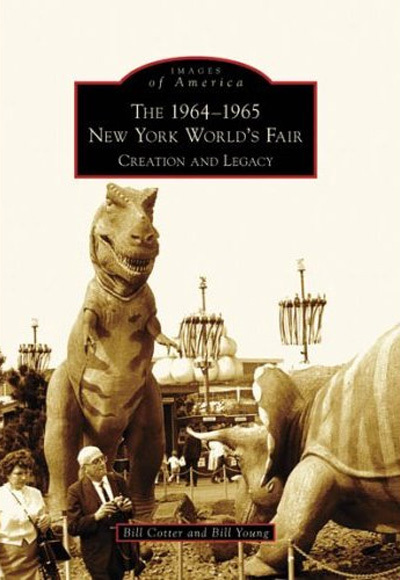 It sold so well that the publisher soon asked for a second volume, released in 2008, that dives into the design and building of the Fair, and where many of the pieces went when the pavilions were demolished. Then, in 2014, they asked us to do a new volume to launch a new series of color books. All of the books are available from Amazon, Barnes & Noble, and many other retailers. Better yet, they're also available directly from me, and I would be glad to sign them. You can oder them online or via mail; details are included with the book descriptions. Just click on the covers to learn more. Please contact me if you have any questions about the books or how to order. Released in 2004 to celebrate the 40th anniversary of the Fair, this book is a collection of vintage and modern photographs that celebrate the creation, life and legacy of the Fair. I am proud to have co-written it with Bill Young, creator of the popular www.nywf64.com website. Click on the cover for more details and how to order your own copy. The success of the 2004 book led to this sequel. While the first volume provided a general overview of the Fair, there just wasn't enough room to tell the whole story. This volume looks at how the Fair was conceived and built, changes made over the years, the demolition process and where remnants can be found today. The book was released on July 21, 2008. Click on the cover for more details and how to order your own copy. I'm thrilled that Arcadia asked us to write the first book in their new color series "Images of Modern America." The first two books were a lot of fun, but it hurt having to convert the photos into black-and-white. Happily this new book is in color, featuring completely different photos than the earlier volumes. The book was released on January 20, 2014. Click on the cover for more details and how to order your own copy. 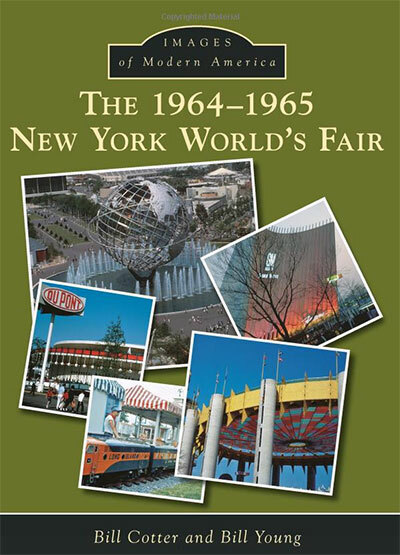 Want an extra large dose of World's Fair memories? Buy the full set of three books at a reduced price. Save on shipping! Impress your friends! Just use the package link at the bottom of each book page. Interested in helping support this site? It's easy! Just come here before shopping on Amazon and start your search in the box above. They pay a small commission for all sales made using that link. You don't need to come back here for another search during the same shopping session - just start here and they will take care of the rest. Please turn off any ad blockers if you don't see the search box. What else is available on worldsfairphotos.com? Copyright © 1998 - Bill Cotter.